Sam Wildow | Miami Valley Today From left to right, facilitator Doug Dolder, Larry Taylor of Piqua, facilitator Bethany Dolder, Pastor David Fishback, Piqua Compassion Network Executive Director Rebecca Sousek, and facilitator Jerrilyn Lowe of Celebrate Recovery. 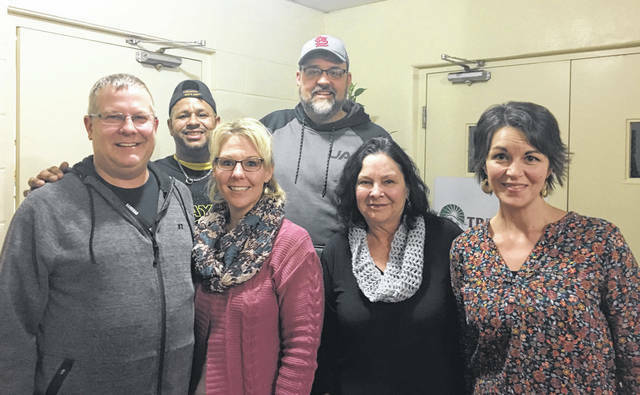 PIQUA — Celebrate Recovery, a Christian recovery program hosted by the Piqua Compassion Network, is celebrating one year of helping local residents with their addictions. From drug addictions to co-dependency issues, Celebrate Recovery has seen over 1,500 people this past year, and Larry Taylor of Piqua is one of those attendees who has been involved since its inception in Piqua. Sousek explained that the Piqua Compassion Network joined forces with the PROTECT Piqua Board and the Piqua Police Department to offer a Christian faith-based, 12-step recovery program called Celebrate Recovery as part of PROTECT Piqua’s Heroin Education and Addiction Recovery Team (HEART) team. Celebrate Recovery meets at the Piqua Compassion Network, located at 531 W. Ash St. in Piqua, on Thursday nights between 7-9 p.m., doors open at 6:45 p.m., and they utilize facilities in True Vine Church. In addition to helping attendees with drug addictions, they also discuss problems of alcoholism, depression and anxiety, grief, sexual addiction, trauma, co-dependency, sexual abuse, food addiction, and compulsive behaviors. Taylor first got connected with Celebrate Recovery through the HEART team, in which Doug and Bethany Dolder, lead facilitators for Celebrate Recovery, are involved. The HEART team includes representatives from the PROTECT Piqua Board, law enforcement, an EMS specialist, a recovery specialist possibly from the Miami County Recovery Council (MCRC), a chaplain/faith-based partner, and a pharmaceuticals specialist. Taylor met with the HEART team in July 2017 and went into rehab in December 2017. Taylor was also at the first meeting of Celebrate Recovery, bringing a family member with him. “I didn’t start using drugs until I was 30,” Taylor said, which Doug Dolder said was not typical. Taylor said that he was never around drugs when he was growing up, but he got hooked on drugs when a friend of his shared pain medication with him. “I had a headache, and my buddy gave me a Vicodin,” Taylor said. Taylor’s addiction grew over 10 years, and he got addicted to cocaine, his drug of choice. He also used methamphetamine and heroin if he could not get cocaine. “I didn’t want to get clean,” Taylor said about when he met with the HEART team. “I just agreed with them (the HEART team) because I didn’t want to get anymore drug charges, to be honest. It wasn’t much longer … that I started using again, probably like a few days later.” While Taylor’s situation did not change overnight, he got connected with MCRC and participated in an outpatient program with them. The morning Taylor was supposed to go to rehab, his father passed away. “I got high the whole time, even like during his viewing and funeral,” Taylor said. Taylor said that he started reading the Bible more and get reconnected to his faith after having grown up in the church. Celebrate Recovery had their first meeting one week after that in January 2017, and Taylor attended that first meeting. He made it to every Celebrate Recovery meeting last year except for one. Since Taylor got sober, he has got a job, his driver’s license, and more. “I got my own vehicle now. I got re-baptized,” he said. He also set up a bank account for his daughter and sees her more. He recently celebrated a year of sobriety. “It’s not about staying clean for me, it’s about trying to become a better person in Christ,” Taylor said. The facilitators emphasized the importance of the faith basis for the program as Sousek said that “not all communities have a faith component” to quick response teams like the HEART team. “Naming that higher power, Jesus Christ, makes a difference,” said Jerilyn Lowe of Piqua, a facilitator for the co-dependency small group discussions at Celebrate Recovery. She added that they are also working with families as a whole. Pastor David Fishback of Piqua said that the community he sees at Celebrate Recovery emulates what he reads about in his Bible. “Lives are being changed because of what God is doing through Celebrate Recovery,” Doug Dolder said. Follow them on Facebook at Celebrate Recovery Piqua or Piqua Compassion Network. For more information, the Piqua Compassion Network can be contacted at (937) 778-8856.
https://www.dailycall.com/wp-content/uploads/sites/30/2019/01/web1_Celebrate-Recovery-cmyk.jpgSam Wildow | Miami Valley Today From left to right, facilitator Doug Dolder, Larry Taylor of Piqua, facilitator Bethany Dolder, Pastor David Fishback, Piqua Compassion Network Executive Director Rebecca Sousek, and facilitator Jerrilyn Lowe of Celebrate Recovery.